In keeping with its tradition of taking the lead in all student-related activities, MIET became the first institution in the state to form the CSI Student Chapter with 276 student members from the departments of Computer Science and Engineering and Information technology Engineering. This is the single largest enrollment while starting a student’s chapter in the entire North India as communicated by CSI. The CSI chapter actively organizes several different events like inter department programming, CSI Day, workshops etc to promote and develop skills on emerging technologies among students. The CSI Chapter from last three years is engaged in holding regional level convention to bring together researchers, engineers, developers and practitioners. MIET organized the 4th Computer Society of India (CSI) J&K State Student Convention in November 2016 in which 400 students and faculty members from the region participated. Mr. Shiv Kumar, Technical Director, National Informatics Centre (NIC), New Delhi and Regional Vice President (Region 1), CSI was the Chief Guest while Mr. Saurabh Agarwal, Head – Marketing and Communications, Middle East and Africa, Tata Consultancy Services and Regional Student Convener, CSI was the Guest of Honor on the occasion. Events included workshop on Big Data by EMC Corp., Hackathon on SMAC technologies and technical quiz for students. Model Institute of Engineering and Technology (MIET) organized the 3rd Computer Society of India (CSI) J&K State Student Convention on 25th-26th February, 2016. Mr. Hirdesh Kumar, IAS, Commissioner Secretary TE, YSS and IT was the Chief Guest on the inaugural function, while Mr. Amit Sharma, Managing Director, SIDCO was the Guest of Honour. The theme of the convention was “Make in India, Make in J&K”. Over 600 students from CSE, IT and MCA departments from MIET and other institutions participated in the 2 day event, which was sponsored by CSI. Highlights of the event included the “Innovation Mela” in which ground-breaking innovative projects by the students were showcased. On the second day an “Idea Fest” competition wherein teams pitched their technical or business ideas to an eminent jury was held along with a workshop on “Developing Creative Ideas” featuring dynamic entrepreneurs from J&K Mr. Babar Afzal, Chairman, Kashmir Ink and Mr. Kunal Gupta, Director, Antarix Technologies. MIET operates one of the largest CSI student chapters in North India with over 500 active student members. The second convention was held on 26-Sep 2014 on theme of “Cloud Computing and Innovation” Prof. R.K Vyas, Regional Vice President, Region I, CSI was the Chief Guest on the occasion . EMC2 Private Limited, the world’s leading IT company in storage technology and cloud computing was the technical partner for the event and conducted a special 2 day workshop and certification on cloud computing for 100 students as part of the convention. 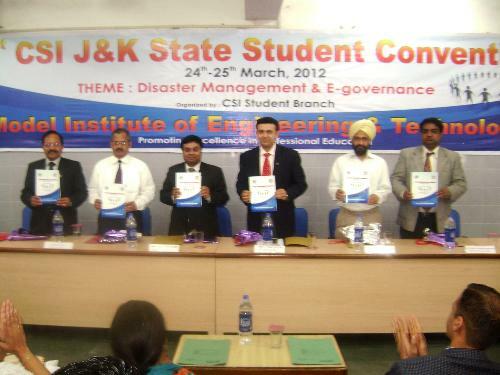 The first J&K State convention under CSI chapter was held in March 2013. Commissioner Secretary, Information Technology, Govt. of J&K, M K Dwivedi, IAS was the Chief Guest while Prof R K Vyas, National Student Coordinator and Prof Bhopinder Singh, Dean Engineering Jammu University and Principal GCET were the Guests of Honour.